We're excited to partner with Inventor of the One Stroke™ Painting Technique Donna Dewberry on her new ReDew program launch! The program teaches techniques and finishes that take minimal prep and make it easy for anyone to give new life to home decor pieces. 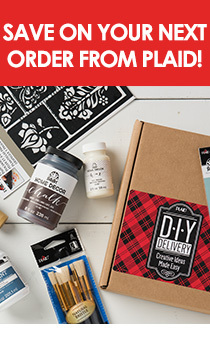 The program pairs our matte chalk finish FolkArt Home Decor Chalk line of paint and finishes with ReDew instructional DVDs and Project Packets, allowing you to make and create for your own home or to resell. Find out more about how you can learn from Donna how to transform garage and flea market finds into beautiful pieces on her website! Here are a couple examples of some of the techniques you'll learn in her program. We love the pretty palette she chose for these pieces!